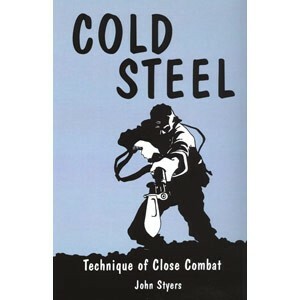 Most people have only been exposed to John Styers work through the book "Cold Steel". It is important to remember that first and foremost this book outlines a BASIC course of close-combat instruction. The elements covered in this system include bayonet, knife, stick and unarmed combat. Styers developed this "system" for BASIC training. The framework of all of these methods remains CONSISTENT through out. 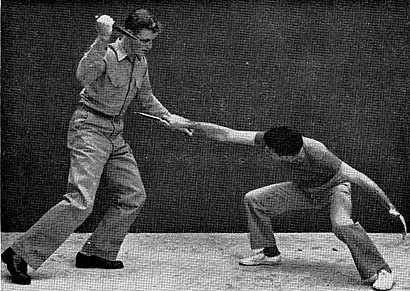 The fundamentals for employing the bayonet, knife, unarmed combat and even the stick work are ALL the same. 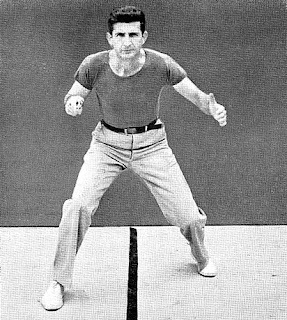 Note in particular the "stance" used for the bayonet, the knife, and for unarmed engagement. SAME stance. The "body" mechanics involved in all the methods presented are at their core foundation ALL similar. This in itself shows "genius". What we see in "Cold Steel" is NOT the STYERS method! It is a "system" that STYERS developed for use in BASIC training. John Styers was a man of both great knowledge and SKILL in a number of man to man combatives. Those who knew Styers personally have told us about his vast interest, knowledge and proven skill in a number of close-combat methods. From the "French" style of bayonet fighting, to "Russian" knife fighting, to boxing, wrestling, jiujitsu, and of course "dirty" fighting. As concerns the STYERS knife work as shown in "Cold Steel" it must also be considered that this was but a SMALL part of Styers overall skill and ability in KNIFE FIGHTING. Again this was a system of BASIC TRAINING! Other sources show this quite demonstrably. The man was a MASTER of bladework. Now the knife sytem taught in "Cold Steel" is excellent. The "problems" that are often cited by others has FAR MORE to do with a lack of understanding in the tactics and techniques as "they" present them, than it does any practical faults in STYERS method. First, Styers was training men for battlefield COMBAT! NOT for a "duel". He assumed (rightly so) that in the so-called "fog" of war men will revert to pure "animal" instinct and move right in for the "kill". Think about this! During the frenzy of real combat you and your enemy are REDUCED to fighting with knives. Men are killing and being killed ALL AROUND YOU. YOUR natural instinct for SURVIVAL will seize you by the throat. You will grip that knife as strongly(your LIFE NOW depends on THIS ONE WEAPON) as possible and MOVE RIGHT IN FOR THE KILL! (WASTE ANY TIME and someone else is going to KILL YOU) You are NOT going to "spar" or "duel", you ARE going to KILL, survive and move on to your next threat or objective. Styers KNEW what real "kill or be killed" combat was like. He realized that MOST men in this dire situation will instinctively SEIZE their knife either in an "overhand" or "ice-pick" grip or an "underhanded" type "hammergrip". They will ATTACK with a determined KILLING intent. THAT IS THE BASIS for the Styers method! 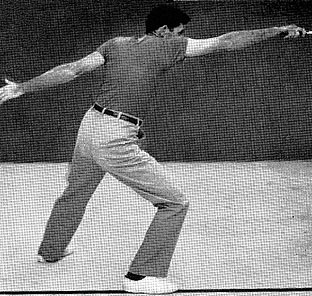 Now the "elements" of Styers method rest on BODY position, ARM position, and KNIFE position. Here is where so many "experts" go right OFF TRACK. Forget any "technique", thrust, slash or "whatever". WITHOUT the FOUNDATION of proper BODY, ARM, and KNIFE position all the "technique" in the world is MEANINGLESS! Without a REAL understanding of Styers FUNDAMENTAL tactic and what MUST be done to make it EFFECTIVE, all THIS becomes NO MORE than two guys trying to cut and stab each other. THIS IS NOT what Styers envisioned. 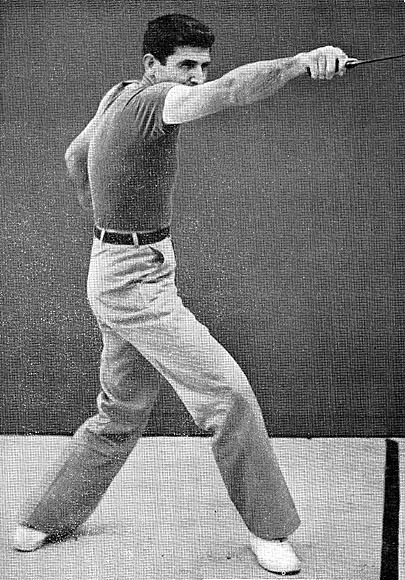 Whether you assume the "Styers" position from a "classic" fencer's pose, as Styers demonstrates(for continuity) or simply advance(lead leg) retreat(real leg) one pace, as long as your UPPER torso remains square and you body rests "springlike" on your legs you're doing OK. BALANCE must be rested on your center point and the rear heel RAISED. Toes and KNEES pointed FORWARD! KEY POINT: Body SQUARED. Torso ERECT. Chin PULLED IN. BALANCE centered. Rear HEEL RAISED. Gripping the KNIFE: Blade vertical to ground. Thumb EXTENDED down backstrap. Slight upward CANT or "cocking" of blade. Weapon bearing hand and arm: Pulled IN. Upper arm slightly BACK from vertical. Elbow tucked into, not away from side. LOWER ARM raised on a plane EVEN with opponents THROAT/EYES. Weapon hand SHOULD NOT break the latreral plane of the upper torso! THIS IS KEY! Offhand hand: Pulled in just like weapon bearing hand. Leanining over or into the opponent. WEAPON HAND EXTENDED and/or SPLAYED OUT!!!!!!!!!!!!!!!!!!!!!!!!!!!!!!!!! Knife LEVEL with ground and NOT POINTED at opponents EYES/THROAT! Offhand SPLAYED out to side. Now the WHY'S that make this method succeed or FAIL. Grab a REAL SHARP FIGHTING KNIFE. 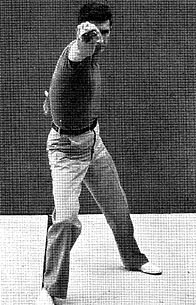 EXTEND IT at FULL arm's length with shoulder "twisted" in for added reach. Tell your training partner to DISTANCE himself from the weapon to a RANGE where he feels at a combatively "SAFE" range. Have someone measure that distance. PULL your weapon arm in to a 3/4 extension and repeat. Have someone measure that distance. PULL in FURTHER to a half bent 90 degree position and repeat. NOW pull the weapon back to the hip and do it all again. COMPARE the measurements at each "distance". MOST people will REMAIN quite consistent in the ACTUAL "measured" distance of safety from tip of weapon. THEY will ALMOST always MOVE in as YOUR arm moves back, BUT the "measured" distance remains very close between ALL the given positions. THAT is the KEY to Styers. Extend your arm and knife all the way OUT. Your partner maintains that critical safety zone FROM the tip of your very real and sharp blade. COULD YOU cut or thrust him EASILY from that position? Not really. A committed BODY lunge or step is about all you could do to close the "gap". Too slow. NOW-Pull that arm ALL the way in so that it barely breaks the lateral plane of the body. AGAIN, your training partner will have a DEFINITE tendency to MAINTAIN the measured distance of the safety zone, but HE will MOVE in. The actual measured distance between him and the tip will vary little. HIS safety zone is STILL his safety zone. What HAS changed is your ABILITY to REACH HIM in the fastest most NON telegraphed manner. FROM the PULLED IN arm position, SQUARED TORSO, and BALANCED stance you can execute the most rapid, cobra-like attacks or counter-attacks with a great amount of RANGE. ANY position OTHER than this one, taken by your enemy WILL put him at a SERIOUS dis-advantage. He will almost ALWAYS be offering YOU something, whereas YOU will be offering NOTHING. His range and speed will be effected by HIS position. Your range and speed will be ENHANCED by YOURS. IMPORTANCE of BLADE POSITION: Keep that blade tip POINTED at the angle stated. WHY? At that angle it is MUCH more difficult for the opponent to gauge the size and length of your blade. May seem like a MINOR "point", but in a real KNIFE fight I'll USE anything that MAY give me an edge. ALL you REALLY need is a thrust, a snap-slash (DO NOT use the back snap cut with this! ), a "stop-hit", and the "hand-cut". The step over and stab is also useful. If "In-Quartata and Passata-soto" are NOT comfortable for you, DON'T use them! Since BOTH of these moves are MEANT as "defensive" counter-attacks against an OVERLY committed assault they are NOT mandatory. The FIVE moves stated above are MORE than enough. PRACTICE THEM moving forward, backward and flanking left and right. 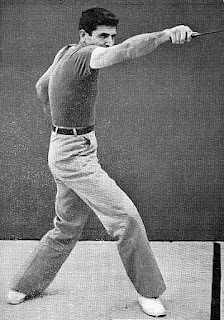 I personally DO NOT train the "back" snap cut on the "snap-slash" because I know of an incident in a real fight where the knife was dislodged from the grip on the "return" when the target reflexively pulled his shoulder up after taking the first slash across the right temple and eyes. This is the story I have heard so I won't comment further. TARGETS: As far as "targets" go...............well the BEST real world advice I can offer is just GO for FLESH! If you see skin, GO FOR IT! Fingers, hands, wrists, throat/neck and face. The "step over and stab" SHOULD be saved for the coup d' grace. John Styer's influence was really BROUGHT to bear AFTER WWII. His methods were developed during the Korean War era, long after his discharge from the USMC. AND........................His job as a FLAG salesman is what brought him into contact with military bases and servicemen ACROSS the country! There are more anecdotes and more info but this is enough for now. I always get a "kick" when guys dismiss different methods and/or ideas out of hand. Then when I ask them to "show me", they get the WHOLE d**n thing WRONG! Of course it looks like nuts. BECAUSE YOU"RE DOING IT LIKE nuts! Ok, hope some of you got some useful insight. Shinan (Founder) Tekkenryu jujutsu Ryokudan (6th degree) Koshinkai Karate under John Burrelle Godan (5th degree) Jujutsu under Clarke of the World Jujutsu Fedaration (now defunct) Sandan (3rd degree) Nippon Kempo under Narabu Sada Nidan (2nd degree) Judo under Masafumi Suzuki Shodan (1st degree) Judo under Yoshisada Yonezuka Shodan (1st degree) Shukokai Karate under Kimura, Kadachi and Yonezuka Shodan (1st degree) Daitoryu Aikijujutsu Instructors Certificate- Charles Nelson System of Self Defense under Charlie Nelson . Stickgrappler's Note: IIRC, this piece was written by Carl Cestari on the old defunct SelfDefenseForums. Don't recall if the original post had pictures or not. I took the liberty to add pictures to Carl Cestari's text. Nice job with the added photos. Oh man! I had not remembered the Close Combat forum! Thank you for the reminder Stickfighter!